With governments and the world of maritime archaeology still reeling from the news that historic warships belonging to Great Britain, the Netherlands, the USA, Germany and Japan and the remains of thousands of sailors have been severely damaged or destroyed by unauthorised commercial salvage by Chinese and Indonesian companies in the Java Sea, allegations have emerged that Dutch based wreck divers have been systematically entering the wrecks of sunken British submarines lost in the North Sea. Several German U-boats and a German cruiser lost in one of the first naval battles of the First World War, have also been visited by divers and salvors, who are alleged to have removed an unknown number of rare historic and collectible objects. In at least two cases there is evidence that human remains were encountered, and that in one of those cases an item of Royal Navy uniform and personal effects are alleged to have been removed from a wrecked submarine and subsequently exhibited at a dive show, thePipeLine can reveal. Replica of the conning tower of a British E-class submarine on display at a a Dutch Dive fair on 3 February 2018. The ladder is understood to have been recovered from a wrecked Royal Navy submarine, believed to be HMS E3, in 2015. In the latest example of the failure of Governments to protect maritime heritage, and maritime military graves, from unauthorised or illegal salvage thePipeLine can reveal new evidence that Dutch wreck divers and salvage companies have removed artifacts from at least four British E class submarines, lost during World War One with all hands. German U-boats and the German light cruiser SMS Mainz, lost with 89 of her crew at the Battle of Heligoland on 28 August 1914 have also been the subject of unauthorised salvage. A number of items taken from the wrecked warships and submarines are claimed to have found their way into private and publicly supported museums in the Netherlands, the UK, Germany and Denmark, while an unknown number of other objects are believed to remain in private collections. A ladder taken allegedly from one of the lost Royal Navy E class submarines was displayed at a dive show in the Netherlands as recently as this weekend, 3/4 February 2018. Divers claim that at least some of the activity has been authorised by and reported to the Dutch Heritage Agency, but it is believed few, if any, of the recoveries were authorised by the British or German authorities as the actual owners of the vessels concerned. Agency. However, he recently approached UK based maritime archaeologists to express his concerns about the activity of some Dutch based dive groups on missing Royal Navy and German vessels and, what he views as, the failures of the Dutch Heritage Agency in getting to grips with the issue of the unauthorised salvage of elements of these vessels and the recovery of iconic or collectible objects from them without permission or reporting. Mr Luttik’s evidence regarding the vessels affected has also been corroborated from other sources and shows that the vessels known to have been subjected to unregulated and unauthorised salvage attempts and the recovery of objects, include a number of British E-class submarines, lost on operations during the First World War. The six hundred and sixty ton E-class submarines, of which fifty eight were ordered, were the backbone of the Royal Navy submarine force during World War One, seeing action from the Dardanelles campaign to the Baltic. Perhaps as a mark of the intensity of their war twenty eight of the class were lost and remain, as submariners say euphemistically, “on patrol”. That is they were lost on active duty, and in keeping with the deployment of submarines as a free ranging stealth weapon, in many cases the loss was due to undetermined circumstances and at an unknown location. Objects recovered and seen by thePipeline in photographs range from control wheels, light fittings and machinery plates from the interior of HMS E5, to the bronze conning towers of the submarines E26 and E34 which are on display outside the clubhouse of another Dutch dive club, Dive Team Ecuador on the Dutch island of Terschelling. However, perhaps the most historically important of the Royal Navy wrecks alleged to have been the subject of unauthorised recovery is the submarine HMS E3. 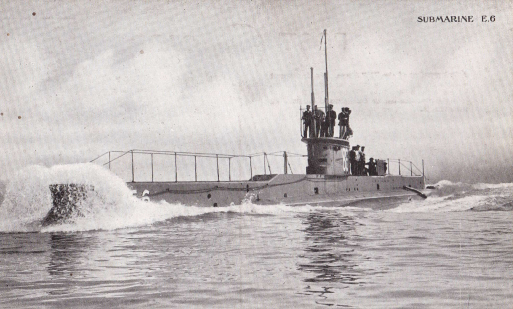 On 18 October 1914 E3 was on patrol in the North Sea off the river Ems. However, unknown to the crew of the British submarine, she was in turn being stalked by the German U-boat U27. Struck by a single torpedo from U27, E3’s stern and stern torpedo chamber were blown off and with her engine and motor rooms open to the sea the submarine sank quickly. None of E3’s crew survived this first sinking of one submarine by another. The stern of the wreck was recovered by a trawler in 1990 and she was visited subsequently by members of Dive Team Zeester which located the remaining section of the boat, which an artists reconstruction suggests was in good condition. The wreck has been visited regularly since and so much material has been removed that a member of Dive Team Zeester told the Dutch diving magazine Duiken [Diving] in 2007 that the wreck had been effectively “cleared out”. However, thePipeLine now understands one of the larger items remaining on the wreck, E3’s periscope, is currently in privately owned storage having been removed from the wreck at the second attempt on or about 13 September 2016 by divers from Dive Team Zeester, working without authorisation from either the Dutch or British authorities. Other material recovered from E3 and this time declared to the Dutch authorities by Dive Team Zeester, includes two escape helmets, an oil tray a wooden box and even a Union Flag, the good preservation of the latter two objects suggesting that anoxic conditions were present in at least parts of the wreck. However, the unauthorised interference with maritime military graves in the North Sea is not just a problem for the Royal Navy and the British Ministry of Defence. The German U-boats U1, U31, UB61, U75, and U97 are also alleged to have been subject to the removal of artifacts, including deck guns. The items were removed either by divers from so called dive teams, or by salvage companies, the two sometimes working together. The largest victim of the activity of unauthorised divers to be identified so far is the five thousand ton light cruiser, SMS Mainz, which was sunk by the Royal Navy during the Battle of Heligoland on 28 August 1914. Eighty nine of her crew were lost with the cruiser, including her commanding officer. Archaeologists point out that this is a self justification which is also used by, for example, many metal detectorists. They argue, such actions are an outdated variation on relic collecting, not archaeology and the collection of objects as souvenirs, or even for museum display in club houses or private museums, destroys the meaning and research value which is derived from preservation of the entire wreck site in situ, or excavation of the wreck site with the full context of the objects found, recorded, curated, conserved and published. It is conceded that on rare occasions, such as the identification of a vessel for casualty registration purposes, it may be helpful to provide a firm identification of a wreck and that might entail the recovery of objects carrying manufacturers plates or similar identifiable features. However, this is the exception rather than the rule and represents a last resort if non intrusive attempts to prove an identification have failed. Generic items such as control wheels and light fittings certainly do not qualify in this regard and should be left in place archaeologists say. Of course such generic items are also often highly collectible and to a large degree, untraceable. Wreckers Ahoy! A gunnery telescope, described as being from German light cruiser SMS Mainz, displayed on the Facebook page of Dive Team Zeester in a post dated 14 August 2015. However, the issue is not simply one of the unauthorised recovery of collectible objects from lost submarines like E3 and her sisters, or from warships such as SMS Mainz. There are disturbing reports that human remains may have been encountered on such dives and in one case at least disturbed, in what at least one witness consulted by thePipeLine found to be a shocking way. While there is no such thing as a maritime equivalent of a war grave on land, protected under international law, the UK Ministry of Defence classes lost vessels which could contain the remains of members of their crew as “maritime military graves” and demands that such sites are left unentered and untouched. Such sites can be designated under the UK Protection of Military Remains Act, which provides full protection from interference within UK jurisdiction and provides penalties for interference from UK companies and individuals in international waters. Military vessels lost on active service are also protected from interference by exemptions under the International Convention on Salvage 1989. However, in the course of preparing this article thePipeLine has spoken to two separate sources, both of whom described independently evidence that human remains had been seen and in one of the cases almost certainly interfered with, during unauthorised dives on Royal Navy submarines. The first witness spoken to by thePipeLine described seeing images showing human remains taken during a dive which entered the interior of one of the lost submarines. However, even more upsetting to relatives of the missing personnel is the account of a very experienced UK based diver, who recalled strong evidence that the remains of at least one missing Royal Navy officer, most likely from one of the lost E class submarines, had actually been interfered with and personal effects and clothing removed. Speaking on condition of anonymity, our source gave this account of a disturbing exhibit which was encountered at a dive show. However, content of another display was shocking. While there is no evidence connecting the material reported to have been seen at Wrakduik to Duikteam Hemiksem or any of the Dutch divers who are currently suspected of the unauthorised entry into military wrecks and the alleged removal of objects, it is clear that all aspects of such wrecks have been seen as fair game to some members of the diver community for almost twenty years and almost certainly for much longer. Archaeologists in the UK claim none of this should have happened. Experts in maritime law consulted by thePipeLine have confirmed that in their view the legal situation regarding vessels lost in the North Sea, British and German is clear. In the case of the Royal Navy vessels the Dutch authorities should not have given permission to touch the vessels, as is alleged, let alone remove objects, unless the UK Ministry of Defence was first consulted and gave its consent. This is because the submarines and other military vessels, including SMS Mainz, are what is described as “Sovereign Immune” in International Law. That is they remain the property of the Government which operated them, or that government’s legal successors. Article 4 of the International Convention on Salvage [ICS] 1989 replicates this rule by saying that such sovereign immune State vessels, used for non commercial purposes, such as fighting a war, cannot be the subject of salvage unless the owner of the vessel, termed the Flag State (in the cases described here, the UK or Germany) gives clear consent. Holland is a party to the ICS, as is the UK. It follows that the reported activity cannot be legitimate salvage without the UK’s consent. This means in turn that if the activity is not legitimate salvage then it is interference with another state’s property. In UK law that would be trespass to goods, which is defined as “wrongful physical interference with goods that are in the possession of another”. The most likely remedy in such cases is the payment of damages. Of course, a submarine or a cruiser are clearly identifiable as military vessels protected by sovereign immunity and any competent diver should know this. In that situation the rules are absolutely clear. Look, but don’t touch, report any find of an unidentified wreck to the appropriate authorities and certainly do not enter the wreck or remove objects. By their nature as a sinister seeming, unseen weapon and their lethal reputation as so called “steel coffins”, missing submarines occupy a particularly evocative place in the popular culture of World Wars One and Two, even generating their own subculture in cinema through such films as “Das Boot”. Indeed, the fact that so many submarines remain “On Patrol” with their entire crews that even a century on from World War One the exact place and circumstances of the death of a relative still represents a melancholy question mark in many family histories, while the unauthorised disturbance of maritime graves can still cause upset and anger. Such missing vessels can also take on an importance in terms of national identity. Polish search teams hope to discover the fate of ORP Orzel, lost in the North Sea in late May or early June 1940, while the Dutch themselves hope one day to discover what happened to HNMS O13, the last Dutch submarine missing without trace, which disappeared while on patrol in the North Sea in June 1940. It is within this historical, cultural and emotional context that initiatives like Remy Luttik’s Project Subident, and other research based initiatives, sit. However, there is only so much that individuals can do, particularly in the face of an ingrained culture among some in the diver community that wrecks, even sovereign immune military wrecks containing the remains of missing crews, are fair game for souveniring and salvage. Ultimately, many maritime archaeologists believe that the problem of the illicit and illegal salvage and destruction of historic military wreck sites can only be resolved on an international basis, with Governments working in cooperation to take a proactive role alongside local administrations and their heritage authorities, educating and where appropriate working with, marine industries and the diver community. In the Java Sea that means effectively a new ABDA [Australian, British, Dutch, American] initiative, this time working with the local Governments of Indonesia and Malaysia as well as Japan, whose warships including the cruiser Haguro have also been severely damaged or destroyed and Germany, whose U-boats U 859 and U-IT 23 have suffered a similar fate. While in Europe, critics of the current stance of Governments and heritage authorities on both sides of the North Sea say there can really be no excuse for the British, Dutch, Danish, Norwegian and German governments, which are after all also partners in NATO and thus ought to have a vested interest in upholding International Law regarding military vessels, not cooperating to end the menace to a shared maritime heritage of the uncontrolled diving on and salvage of, lost warships and submarines. Vessels which to the public are seen widely as graves and memorials to the crews who served on them and in so many cases were lost with them. Of course, part of that public are the community of divers and it is only fair to say that many sports divers now take a similar view to the majority of maritime archaeologists and recognise that, as Remy Luttik told thePipeLine, the world has moved on, and a core policy of look but don’t touch and take only photographs, is the most effective way to both sustain our shared maritime cultural heritage into the future and to show respect to those who went to down to the sea in ships, many, military and civilian, never to return. “Shipwrecks often have multiple values, being cultural historical, ecological or as places of commemoration (graves). In general divers and amateur archaeologists are visiting wreck sites on the North Sea regularly, most of them with good intentions. We are aware that activities like these occasionally are taking place on the North Sea. Although protecting cultural heritage underwater is a shared responsibility and we are not the only party accountable, we are taking the matter very seriously. In a few cases, agreements with divers have been made to do surveys on unidentified wreck sites. If necessary, they are allowed to take up objects for identification. This has been committed into an agreement with the divers, therefore this should only happen under strict regulations of the government. thePipeLine understands that a representative of Dive Team Zeester has told another media outlet that the divers deny any wrong doing, describing their work as archaeological in nature, undertaken to preserve history and provide comfort to relatives of the missing. However, archaeologists consulted by thePipeLine point out that however good the intentions, this statement does not let the divers off the hook as far as the UK owned Royal Navy wrecks are concerned. Even if the UK gave consent for the removal of objects, UK policy towards historical wrecks is governed by the Rules of the UNESCO Convention on the Protection of the Underwater Cultural Heritage. It is clear that the nature of the work undertaken by the Dutch divers, with its focus of the recovery of artifacts for their own sake, for the most part without any formal archaeological recording and the dispersal of those artifacts to separate private collections, is certainly not compliant with the UNESCO rules. Thus the UK could not give consent for the work in any case, unless it wished to breach its own policy as stated to Parliament. 04/02/2018: This news story has been updated to include a statement from the Dutch Heritage Agency.